Custom woodwork has become more and more popular in recent years, as homeowners are choosing to adorn their living spaces with unique wooden features rather than mass-produced kitchen cabinets and self-assembly entertainment centers from The Home Depot. After all, the goal of home improvement is to transform your house into a place that truly feels like home, and nothing can personalize your space better than custom woodwork that was designed and handcrafted with your individual style and needs in mind. It’s the details that really count when it comes to home remodels and renovations, so why not invest in high-quality custom cabinetry, hardwood stairs, and a built-in home office that you will love for years to come? Bailey Custom Woodworking is a family-owned and operated custom woodworking business that has been serving local residents for more than three decades. As Springfield’s Top Rated Local® custom woodworker, we have built our stellar reputation on years of industry experience, skilled craftsmanship, and exceptionally friendly service. When you choose us for your custom cabinets, kitchen bar, fireplace mantel, or any other custom woodworking project, you can rest assured knowing you’ve hired the best in the business. But don’t just take it from us — check out our client testimonials and photo galleries of our latest work! Part of what makes Bailey Custom Woodworking the preferred woodworking business in Springfield, IL is our genuine dedication to each and every one of our clients and their projects. To us, you are much more than just a customer; you are someone with a unique vision for their home who has entrusted our team of skilled woodworkers and custom carpenters to make it happen. That’s why we treat every custom woodworking project as if it were our own and pour every last ounce of effort, skill, and creativity into it. In order to bring your home improvement ideas to life, our team will first meet with you to discuss your home improvement needs and goals. Are your kitchen cabinets too small or outdated? Do you want to add a custom entertainment center in your basement? Are you looking to accentuate the curves of your foyer with a custom staircase? Whatever your vision is, it is our job to bring it to life as accurately as possible, and that means taking the time to listen to everything you have to say and including you in all of the decision-making. Ready to get started on your next home improvement project with beautiful, one-of-a-kind wood features from Bailey Custom Woodworking? Give us a call today or contact us online to get a custom quote! 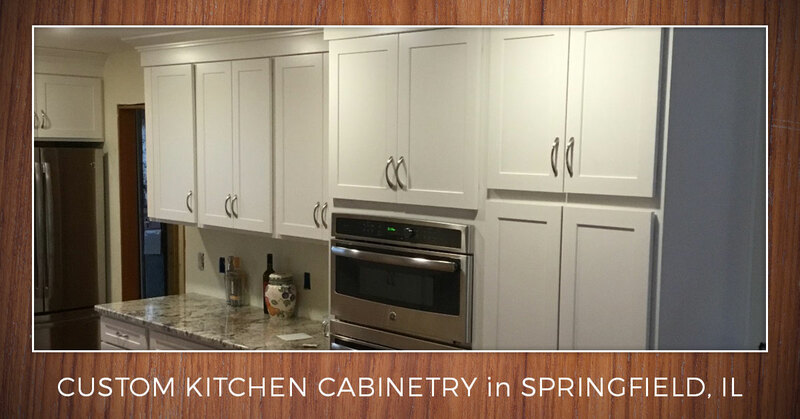 And, if you’re interested in learning more about custom kitchen cabinetry, keep scrolling! As with all the other features in your home, your kitchen cabinets say a lot about you. The style, color, age, and type of wood your cabinets are made of can determine the look and feel of the room — and the entire house. In fact, wooden cabinets are often the focal point of the kitchen, making them an equally functional and aesthetic addition to your space. That being said, if there is one kitchen feature to splurge on during your kitchen remodel, the cabinets are it! This is where custom cabinetry comes into play. Choosing a custom woodworker to create a unique cabinet system specifically for your kitchen is one of the best things you can do to tie the room together. Rather than picking out one of the dozen cabinet designs at your local hardware store, you will be able to determine the exact size, style, wood type, stain color, and many other factors when you have a custom woodworker design your cabinets from scratch. This way, your cabinets will be handcrafted to accentuate other elements of the kitchen, like your hardwood floors and granite countertops, rather than standing alone as one stunning work of art. Of course, you wouldn’t be able to tie your kitchen together in a unique way if you didn’t have very many options. That’s the beauty of custom cabinetry; the possibilities are endless when choosing the type of wood, the stain, the hardware, and everything in between. Going for a rustic bohemian look? We’ll help you pick out the perfect combination for a trendy boho style. Looking to modernize your kitchen? We can guide you through all the latest styles in kitchen cabinetry and hardware. Just think of your new kitchen cabinets as a blank canvas that you can use to bring your idea of a perfect kitchen to life! Lots of modern kitchens lack sufficient storage space, and custom cabinetry offers the perfect solution. When your kitchen wall cabinets are built from scratch by a custom carpenter, they will work with you to design them in a way that makes the best use of the space. While this looks different for every house, it could mean integrating kitchen floor cabinets with your center island, building a lazy susan in the corner, or spanning your hanging cabinets, lower cabinets, and kitchen drawers across an entire wall. Another great thing about custom cabinetry is that it can fit in with any style home. Whether you are remodeling your home with trendy modern features, are going green with eco-friendly appliances and reclaimed wood decor, or are creating an old-style country atmosphere with plenty of antiques, you are sure to find the perfect cabinet style to match your furnishings. Custom woodworkers are accustomed to thinking outside the box and creating unique kitchen cabinet designs to compliment a variety of styles, so don’t be afraid to ask us for recommendations about what would look best! Unlike self-assembly cabinets that are built with cheap plywood or particle board, custom cabinets are made to last. At Bailey Custom Woodworking, we are proud to offer a diverse selection of beautiful hardwoods, including oak, hickory, maple, cherry, and many others. Sturdy and durable, our custom hardwood cabinets are made to stand the test of time with stains and paints that offer both beauty and protection. No matter what style of custom cabinetry you choose, you can guarantee that they will hold up for years — even decades — until you decide to mix it up again with a cabinet refacing service. Not only are custom cabinets made from top-quality wood, stain, and hardware, but they are also built by skilled hands that have created hundreds of kitchen cabinet systems over the years. Part of the problem with mass-produced cabinets is that they are made in a rush, meaning that quantity is a higher priority than quality in most cases. When you choose custom cabinetry for your home remodel, you can rest assured that your kitchen cabinets will be made by a real person who has years of experience doing just that: creating high-quality custom woodwork from scratch. Of course, there are many other factors that contribute to the value of custom cabinetry, but now that you know some of the basics, let’s take a look at the best hardwoods to use for your kitchen cabinets! As previously mentioned, lots of do-it-yourself cabinet sets from major retailers are made with plywood, particle board, or a combination, making them a cheap alternative to hardwood that simply won’t last. And if they are made with genuine hardwood, odds are, they weren’t made by a skilled craftsman who specializes in custom woodwork. That being said, here are some of our favorite cabinet wood types to consider when remodeling your kitchen with custom cabinetry. Ah, the classic. Oak is a beautiful hardwood that is commonly used in custom woodworking, particularly kitchen cabinet building due to the fact that is incredibly dense and resistant to shock, dents, and scratches. Characterized by a distinct streaky grain pattern and an open-pore structure, many people prefer the rugged, textured look of red oak kitchen cabinets. Oak is also unique in that it is available in many different colors, from red oak and white oak to the unique pinkish tones in between. There truly is something for everyone when it comes to picking out the perfect color of wood and cabinet stain for oak cabinets! Maple hardwood, on the other hand, is typically lighter in color than oak and has a less pronounced grain, resulting in less contrast and a more uniform look. Homeowners with contemporary kitchens tend to opt for maple kitchen cabinets because they add a natural element that is simple, sophisticated, and very easy on the eyes. It is also less dense than other hardwoods, making it a lighter option for kitchen wall cabinets and lazy susans while still maintaining a beautiful hardwood appearance. A subtler alternative to oak, hickory cabinets offer the same defined wood grain, but it is usually lighter in color and displays more yellowish tones than those that are red, orange, or pink. Like with maple cabinets, many homeowners choose a light stain or clear finish for their hickory kitchen cabinets, as they display a beautiful rustic style all on their own. They are also incredibly dense and can withstand years of opening and closing without showing dents or scratches, making them a top choice for homeowners with young children who are looking for durable kitchen cabinets. If you like the look of dark red hardwoods, you’ll love custom cherry cabinets. Cherry hardwood is distinctively warm and deep in color, darkening significantly with time. Unlike oak, maple, and hickory cabinets, the wood grain in cherry cabinets is more irregular and swirl-like, resulting in a unique, irregular pattern that is accentuated by the deep red tones of the wood. Cherry cabinets look great in modern kitchens with dark countertops and bright silver appliances, as the dark red tones in the wood of these contemporary kitchen cabinets evoke a sense of sophistication and luxury. Though it is not technically a hardwood, alder is used in many rustic, country-inspired kitchens with a barn or cabin-like aesthetic. Alder cabinets are unique in that they are lighter in color but not too yellowish, less streaky with a soft grain, and have more knots than other cabinet wood types, giving off a nice Earthy feel. Knotty alder wood cabinets are also much lighter in weight than hardwood kitchen cabinets, offering the best of both worlds when it comes to choosing affordable yet high-quality wood cabinets for your kitchen remodel. Most custom woodworkers will also offer a few exotic wood options when they begin designing your modern kitchen cabinets. At Bailey Custom Woodworking, we offer lyptus, a unique hardwood that comes from sustainably grown trees in plantations across South America. Its hardness is comparable to that of maple (less dense than oak), bringing with it a unique warm color and grain pattern that cannot be found in any of the previously mentioned hardwoods. Perfect for the homeowner who wants to make unique kitchen cabinets the centerpiece of the room, lyptus cabinets offer a one-of-a-kind look that lends itself well to custom designs and bold hardware. We hope that this information has given you a better idea of the value of custom cabinetry over mass-produced cabinet systems, as well as the natural beauty that different cabinet wood types can bring to your kitchen. At the end of the day, there is no right or wrong way to go about choosing the right wood type for your custom cabinets. It’s all about envisioning your ideal kitchen and picking out the type of wood, hardware, stain or paint, and overall cabinet style that can bring your kitchen ideas to life. Ready to get started on your next home improvement project with custom kitchen cabinets made for you, and only you? Browse through our product catalog for custom cabinetry inspiration and contact Bailey Custom Woodworking in Springfield, IL to set up a consultation with our custom carpenters. Thank you for choosing our family-owned and operated custom woodworking business; we look forward to helping you build your dream kitchen!